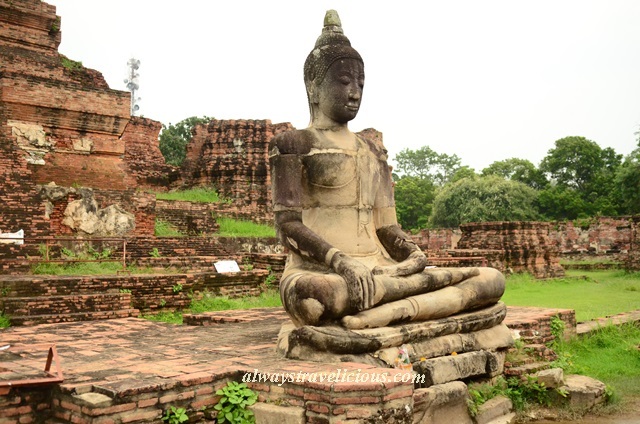 Wat Mahathat @ Ayutthaya, Thailand - Always Travelicious ! The Buddha’s head survived the attack from the Burmese army in the 1760’s, the crushing powers of tree roots, and yet still smiling, as if letting us know – all is well. while some are in rubbles, where you could only imagine the ruins were perhaps once a ceremonial hall or an altar for prayers. Complete Buddha statues are a rare sight in Wat Mahathat. The sight of hundreds of decapitated and dismembered Buddha statues dispersed throughout the temple is devastatingly stunning. The Buddha statues are “made-do” with miscellaneous parts; pieced together like incomplete jigsaw puzzles. Visiting Wat Mahathat was extraordinary. It was serene yet a little forlorn with headless Buddhas that witnessed the rise and fall of the Ayutthaya Kingdom. Entrance Fee: 50 Baht for foreigners and 10 Baht for locals. Yes it’s really stunning and so vast ! Initially I planned to rent a bicycle to go around , then when I saw the place, I got on a tuk tuk instead ! Haha. I was alone for the first time and nervous, so I hired a tuk tuk… alone! Haha. Pingback: Wat Chaiwatthanaram @ Ayutthaya, Thailand | Always Travelicious ! Hi KJ. We hired a tuk tuk too, 600 baht, 4 hours and 6 Wat’s in total, plus lunch near the river bank. I found Ayutthaya to be a fascinating place, the history, the Khmer style temples in ruins, will have to go back again and cover some temples that I missed out on.